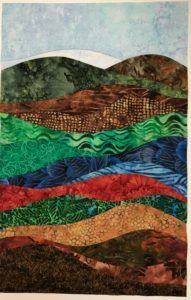 Thank you to all my followers and customers for making 2018 a wonderful art quilt year! 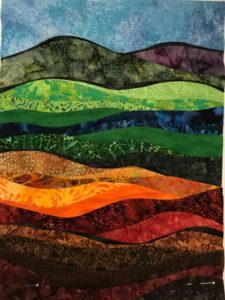 It is my first year with only one show so Internet sales through Etsy and reaching out to new customers and interested quilters through this website have been crucial to my success. I came back from a super successful early December show and jumped right into making some smallish abstract landscapes which have become very popular. You can see some pictures of four pieced but unfinished ones in this blog. It was fun to sort out colors and design for four slightly different landscapes at the same time and then spend a week piecing them uniquely. No patterns so it is always a bit of discovery as I proceed through the creation process! Always fun! Then I was distracted by some last minute gifts and ornaments to be made for family and friends. 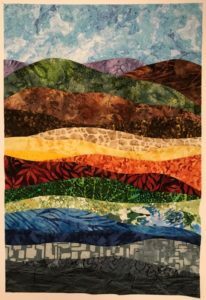 I’m looking forward to a fun week of quilting in the new year on the new abstract landscapes. I hope you keep enjoying my blog and the fun of creating abstract contemporary art quilts.